You can check the remaining recording time on the SD card as well as the remaining battery power. If in the still image mode, go directly to step 4. Display the remaining recording time. 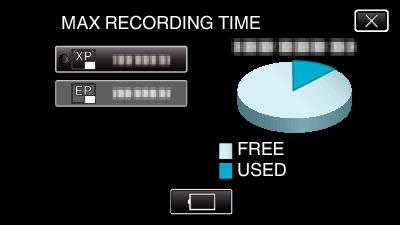 The remaining recording time is displayed only in the video recording mode. To display the remaining battery power, tap . will not be displayed when the AC adapter is connected. To exit the display, tap . 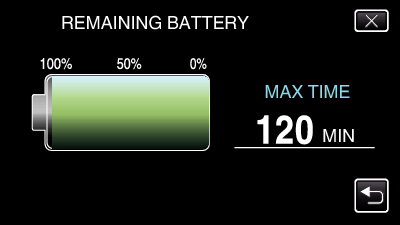 Display the remaining battery power. 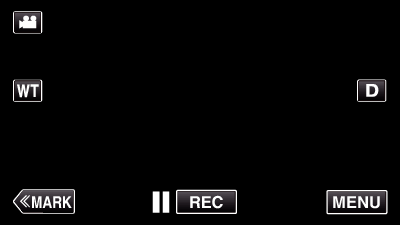 For video recording, tap to return to the remaining recording time display. This display does not appear while recording still images. Tap to exit the display. Remaining battery power will not be displayed when the AC adapter is connected. You can change to the desired video quality by tapping on it from the remaining recording time display. The actual recording time may shorten depending on the shooting environment. 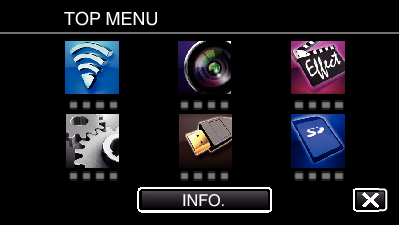 Still images that are captured during video recording or video playback are saved at a size of 1920 x 1080. The above are values when “LIGHT” is set to “OFF” and “MONITOR BRIGHTNESS” is set to “3” (standard). Recording time may differ depending on the shooting environment and usage.